Place marinade ingredients in a small saucepan. Bring to a simmer and stir over medium heat until reduced slightly, 5-7 minutes. Wrap scallops in prosciutto and set aside. Thread and orange segment, scallop, pepper, orange, scallop and pepper onto a skewer. Repeat with remaining skewers. 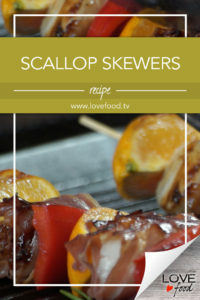 Place skewers on a platter and cover with marinade. Heat a grill pan or BBQ to medium-high heat. Brush rungs with olive oil. Place skewers on grill and leave to cook until prosciutto is crispy and grill marks appear. Rotate until sides are fully cooked. Top with a squeeze of orange and serve. EPISODE 6 from Clerisy Entertainment on Vimeo.